Our Genuine Leather Women Long Clutch Wallet is the ideal representation of style and comfort. The exterior is made from genuine cow leather that ensures a soft texture to touch that can have your words of choice engraved. 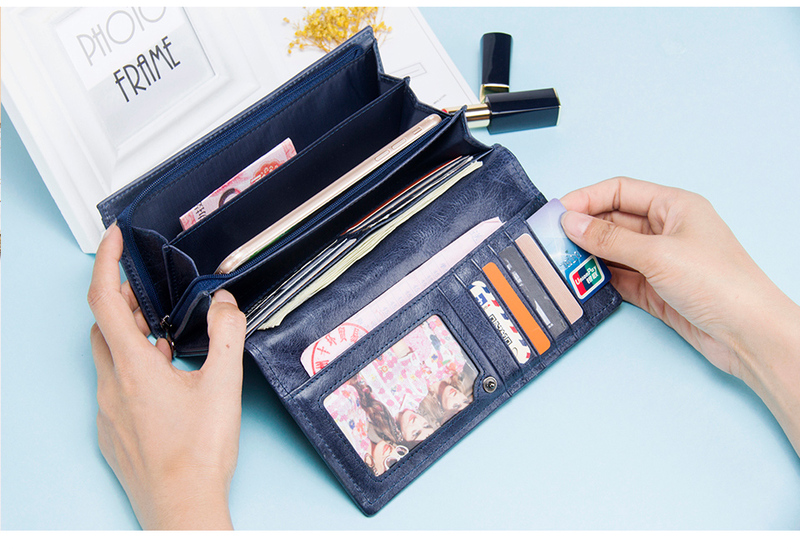 The interior is made of polyester and has a variety of compartments including a photo holder, cardholder, interior zipper pocket, cell phone pocket, zipper pouch, interior compartment, interior slot pocket, and a note compartment. Available in green, red and blue to match almost every outfit. Don’t leave without checking out our shoulder bags. Nice wallet. Genuine leather. Soft, good smell. Writing looks great, though she неброская. Satisfied with the purchase. Came quickly. Thank You Very Much. Excellent wallet. Soft, pleasant to the touch. Just like in the description. Only engraving can be brighter. Delivery fast. The best wallet in the world! SUPER! I AM VERY HAPPY! The Goods of good quality! The Only problem out-it is mixed color, instead of green Burgundy sent (the photo lighter came out). Seller returned the money, thanks to him! Perhaps more, wish green.! genuine leather. lettering pretty good. sent very fast. satisfied i. more order in this shop'll. thank you!!! Заказываю уже 2 раз! Отличный кошелёк!!!!! Рекомендую! wallet excellent!!!! leather! fast shipping!!!! super! recommend!